Concept: Strider creates financial technology systems that help companies connect with their clients and assists individuals on the path to financial enlightenment. How the business idea came about: While working at the JSE, I dealt with a a lot of stock market related questions from the public and realised that few people understood the stock market or had access to tools and resources to educate themselves about it. I knew there had to be a better way to educate, help and show people how to start their stock market journey, and so the concept was born. 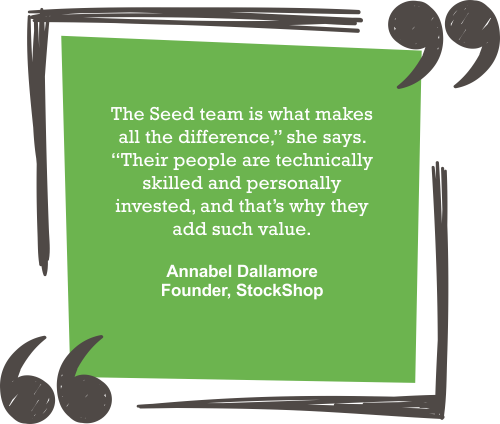 Annabel Dallamore conceived the idea for Stock Shop while working at the Johannesburg Stock Exchange (JSE). Dealing with stock market related questions from the public, Annabel realised that few people understood the stock market or had access to tools and resources to educate themselves about it. She knew there had to be a better way to educate, help and show people how to start their stock market journey, and so the concept of Stock Shop was born. Annabel says that despite being before its time in many ways, the company is entering its growth phase and is in talks with various organisations (in the UK and Kenya, among other places) about global opportunities. She places value on her mentorship relationship with her Seed mentor and says he’s been helpful in teaching the Stock Shop team about how to pitch to investors whilst providing support and a soundboard in what might otherwise be a lonely entrepreneurial landscape.